ISO/IEC 15693 and ISO/IEC 18000-3 , prolonging a successful story of NXP in the field of vicinity identification systems. Whenever connected to a very simple and easy-to-produce type of antenna (as a result of the 13.56 MHz carrier frequency) made out of a few windings printed, winded, etched or punched coil, the ICODE SLIX IC can be operated without line of sight up to a distance of 1.5 m (gate width). No battery is needed. When the smart label is positioned in the field of an interrogator antenna, the high speed RF communication interface enables data to be transmitted up to 53 kbit/s. An intelligent anticollision function enables several tags to operate in the field simultaneously. The anticollision algorithm selects each tag individually and ensures that the execution of a transaction with a selected tag is performed correctly without data corruption resulting from other tags in the field. Near Field Communication (NFC)contactless cards can be a wireless communication standard which helps two devices within a short range to ascertain a communication channel in a short time through radio waves from the 13.56 MHz frequency range. NFC can be a useful technology for data between two devices near one other. As it needs both the devices to get near the other person (lower than 10 cm), it is more secure thanother wireless technologies like Bluetooth and Wi-Fi. Hence, it could be described as simple and easy , secure tool for establishing quick two-way connections for data. 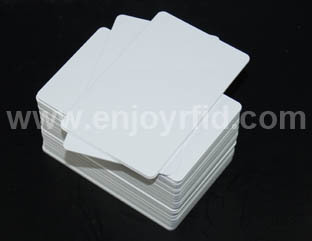 As the biggest differentiating factor for NFC over RFID is that it's a two-way communication tool, one of many devices/cards could have a passive NFC tag which could decrease the cost but still behave in the same manner every other RFID tag.